The Matron in Chief of the Queen Alexandra's Imperial Military Nursing Service were the highest serving officer in overall charge of the QAIMNS. The role for the modern day QARANC is now known as the Director Army Nursing Services (DANS) and the correct full title for DANS is the Director Army Nursing Services and Matron-in-Chief (Army). Miss Sydney Browne was the first appointed Matron in Chief of the newly formed QAIMNS. When she retired from the QAs she became the Matron in Chief of the TFNS/TNS in 1907 and upon leaving this appointment in 1922 she became the first President of the College of Nursing which became the Royal College of Nursing (RCN) in 1928. Miss Sydney Browne was later made a Dame. Before becoming the Matron in Chief Miss C H Keer was Principal Matron in South Africa of the Queen Alexandra's Imperial Military Nursing Service. She was previously an Army Nursing Service nurse since December 1887 where she nursed at Royal Victoria Military Hospital Netley and then served in Egypt from 1888 to 1894. Miss Keer then served at Dover and was then posted to Natal during the Boer War in 1899 where she was awarded the Royal Red Cross and the two South African medals of the Queen’s and King’s South African medals and Miss Keer was also mentioned in Despatches. She was one of the first ANS nurses to be sent to the South African War. Upon return to England in 1902 Miss Keer then served at Colchester and when the ANS was reformed to the QAIMNS she remained a military nurse and in 1903 she was appointed Principal Matron at Pretoria, South Africa. At the time of her appointment there were 14 military hospitals serving soldiers and their families and one of the main duties of Miss Keer as the Principal Matron was to supervise and inspect each hospital. Miss Keer has many qualifications for the high office to which she has been appointed. Her quiet, modest confidence, confidence evidently born of knowledge, cannot fail to beget the conviction that the choice which placed the reins of government in this important position in her hands and that she will maintain the dignity and prestige which the Service has acquired during the tenure of office of the present Matron-in-Chief Miss Sydney Browne, R.R.C. During her time as the Matron in Chief Miss Keer was involved in improving the pay, allowances and conditions of the nurses of the QAIMNS and making changes to the Military Families Hospitals. Miss C.H Keer (RRC) died on the 29 December 1925 at home in West Worthing aged 71 years. Dame Ethel Hope Becher GBE, RRC and Bar became the Matron in Chief of the QAIMNS on the 1 April 1910. Her predecessors served as Matrons in Chief for four years but Dame Becher remained at the War Office until 1919 because of the outbreak of World War One in 1914. A fascinating exchange of letters that explains why Miss Becher’s term of office was so long, that includes correspondence with Sir Launcelotee Gubbins the Director General of the Army Medical Services and the Chairman of the Army Nursing Board can be read in In the Company of Nurses: The History of the British Army Nursing Service in the Great War . Miss Florence May Hodgins was Matron in Chief of the QAIMNS from 1924 to 1928. During the Gallipoli campaign of 1915 she was the Matron of the General Hospital. She then went to Egypt and then to Basra and Amara in Mesopotamia (modern day Iraq) where she was the Matron of No 23 Stationary Hospital which then moved to Baghdad (cited in the book Queen Alexandra's Royal Army Nursing Corps (Famous Regts. S) by Juliet Piggott). Miss Marguerite Elizabeth Medforth was Matron in Chief of the QAIMNS from 1930 to 1934. It was Miss Marguerite Elizabeth Medforth who introduced the yearly tradition of the Annual Tennis Day to the QA's (cited in the book Queen Alexandra's Royal Army Nursing Corps (Famous Regts. S) by Juliet Piggott). This was soon followed by an Annual Sports Day in Aldershot. The then tradition was for the Matron in Chief to attend both the Annual Tennis Day and the Annual Sports Day. Both events continue today and the equivalent role, the Director Army Nursing Services (DANS) and Matron-in-Chief (Army), attends these important social and sporting events for the QARANC. 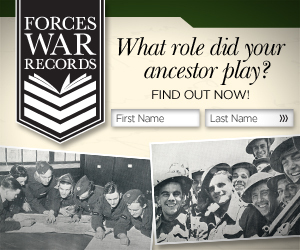 Dame Louisa Jane Wilkinson (DBE, RRC) was a member of the QAIMNS Reserves in August 1914. She was briefly married in 1917 but sadly her husband was killed soon after in the Great War. She then became a regular member of the QAIMNS where she not only saw service in the First World War but also the Second World War. Dame Louisa Jane Wilkinson became the Matron in Chief of the QAs from 1944 to 1948. Upon retirement she became the Colonel Commandant and set up the QA Association. 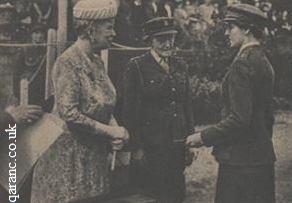 Dame Louisa Jane Wilkinson at the Anstie Grange Training Depot QAIMNS with Dowager Queen Mary. Dame Katherine Jones was the Matron in Chief of the QAIMNS during the majority of World War Two serving from 23 July 1940 to 1944. The book Sisters In Arms: British Army Nurses Tell Their Story has a portrait photo of Dame Katherine Jones. During the First World War Katherine Jones was training as a nurse at St Bartholomew's Hospital, London. She then joined the Queen Alexandra's Imperial Military Nursing Service (QAIMNS) in 1917 and rejoined in 1937. Sister Katherine Jones was mentioned in despatches whilst serving in Palestine. In 1938 Katherine Jones returned to Great Britain where she was appointed the Principal Matron at the War Office cited in the book Sisters In Arms: British Army Nurses Tell Their Story . In 1939 World War Two was declared and Senior Principal Matron Katherine Jones was responsible for mobilising over 1000 QAs to France to serve with the British Expeditionary Force (BEF). The first QAs into France landed at Cherbourg on the 10 September 1939 and were joined by Senior Principal Matron Katherine Jones the next day cited in the book Sisters In Arms: British Army Nurses Tell Their Story . Along with the British Army the QAs retreated to Dunkirk on the 26 May 1940 and all were safely returned to England. In July 1940 Miss Jones was promoted to Matron in Chief of the QAIMNS at the age of 44 years. As Matron in Chief of the QAIMNS Dame Katharine Jones DBE RRC wrote the introduction to Grey and scarlet : letters from the war areas by army sisters on active service . This collects letters sent to the Matron in Chief by Nursing Sisters of the Queen Alexandra’s Imperial Military Nursing Service and Territorial Army Nursing Service from France, Iceland, Tobruk, Sudan, Eritrea, Gibraltar, Greece, Middle East, North Africa, Malta, Malaya and Singapore. The Territorial Force Nursing Service was formed in 1907 at the same time as the Territorial Force. Its President was Queen Alexandra who was also the President of the QA's. In 1921 it was renamed to the Territorial Army Nursing Service (TANS) inline with the newly named Territorial Army rather than Territorial Force for the British Army. Those Matrons-in-Chief QAIMNS/QAIMNS(R) from 1902 to 1924 and the Matrons-in-Chief TFNS from 1909 to 1931 were all Boer War Veterans. Another page of interest is Colonel Commandant QARANC.